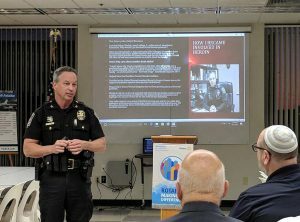 At our October 17, 2017, Batavia, OH Rotary meeting Newtown Police Chief Tom Synan who is also the co-chairman of the Hamilton County Opiate Task Force was our guest speaker. He spoke about the heroin epidemic in Southwest Ohio. 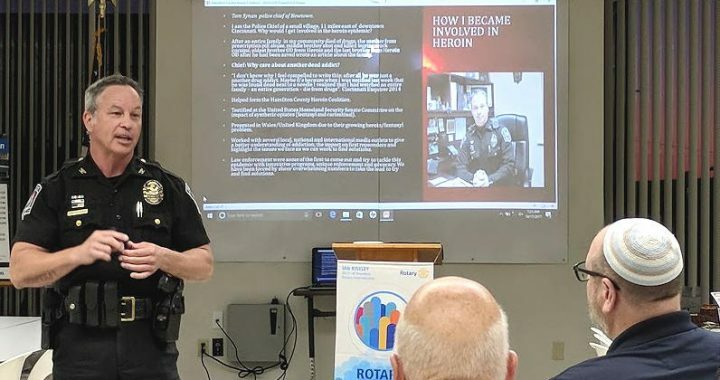 It was an eye-opening presentation about a serious drug problem killing at an accelerating rate right here where we live. It gets worse than heroin, however. Synthetic substitutes that are many times more power and becoming lethal making this the dreaded problem it is. Southwestern Ohio is one of the worst areas for this problem. Synthetic phenetol is 50 times more powerful than heroin. Opioids goes to the brain stem and rewires it. Takes a long time to recover....one to three years. Opiods are bought by users on the Internet and sent by US mail. While legislation is being enacted to inspect suspect packages, but right now this is a primary way of delivery. Opioid overdose is now the number one cause of accidental death and more are dying of this and in car accidents in this country. Last year 64,000 people died. President Trump has called this a national health emergency. Doctors are partly responsible as the drug manufacturers are the gateway to people become addicted. 75% of people becoming addicted started out with prescription meds. People are in pain, insurance pays for the drugs. Drug companies make them and doctors prescribe them. People want instant relief through a pill from physical and mental discomfort. The primary user group is white males 27-50, although it is used by those of ages 12-70. All strata of society is affected -- from professionals to the working class. Causes of addiction are trauma, genetics or the environment. In 1929, in the blue-collar city of Portsmouth, Ohio, a company built a swimming pool the size of a football field; named Dreamland, it became the vital center of the community. Now, addiction has devastated Portsmouth, as it has hundreds of small rural towns and suburbs across America—addiction like no other the country has ever faced. Also, I'd like to turn your attention to Dr. Kayleen Schreiber's website and blog where she made a video that makes clear the danger of opioids. 64,000 people die every year (and the number is steeply climbing) of opiate overdose. Carfentanil is an analogue of an opioid analgesic known as fentanyl, which has a deserved reputation for being very strong. However, carfentanil is up to 100 times more powerful than fentanyl and 10,000 times more powerful than morphine, according to the Drug Enforcement Administration (DEA). In addition, carfentanil is 50 times more potent than heroin. As a result, it is viewed as an exceptionally dangerous substance with significant potential for overdose. The drug was first developed in 1974 and marketed under the name Wildnil. It served as an opioid analgesic for large animals such as elephants. Obviously, it was not meant for human consumption, but there has been a rise in human use of the drug recently. The extreme potency of carfentanil makes it hazardous for humans to ingest, according to the U.S. National Library of Medicine. Posted in News, Personal, Rotary.